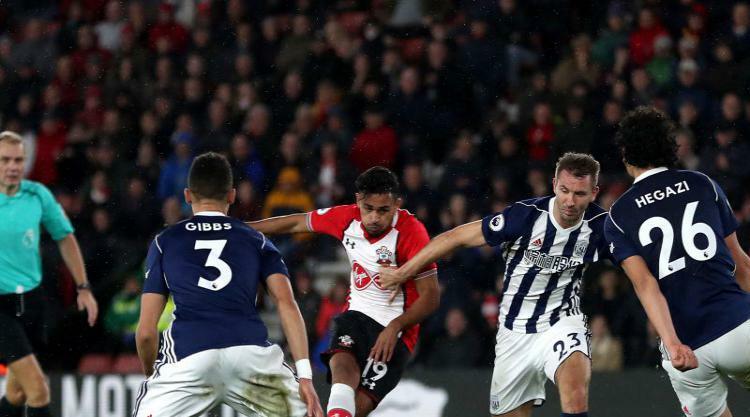 A stunning solo goal from Sofiane Boufal lit up St Mary’s as Southampton beat West Brom 1-0. The substitute ran fully 70 yards from inside his own half and left three defenders on their backsides – two of whom had collided with each other – before sliding the ball home for a truly memorable strike. It was going to take a moment of supreme quality, or abject stupidity, to settle this otherwise drab affair and thankfully it was the former as Southampton’s record signing secured their second home win of the season. Ryan Bertrand’s free-kick flicked off the head of Jonny Evans in the wall and then came back off the top of a post. Pulis brings on McAuley for Barry and goes 3-5-2.